Give the universities the option to set differential tuition rates for programs and campuses within their systems. The proposed tuition policy changes would create a more rational system of funding public higher education in New York. Current funding for SUNY and CUNY is characterized by erratic and sharp tuition rate increases, which coincide with periods of economic recession or budget crises. 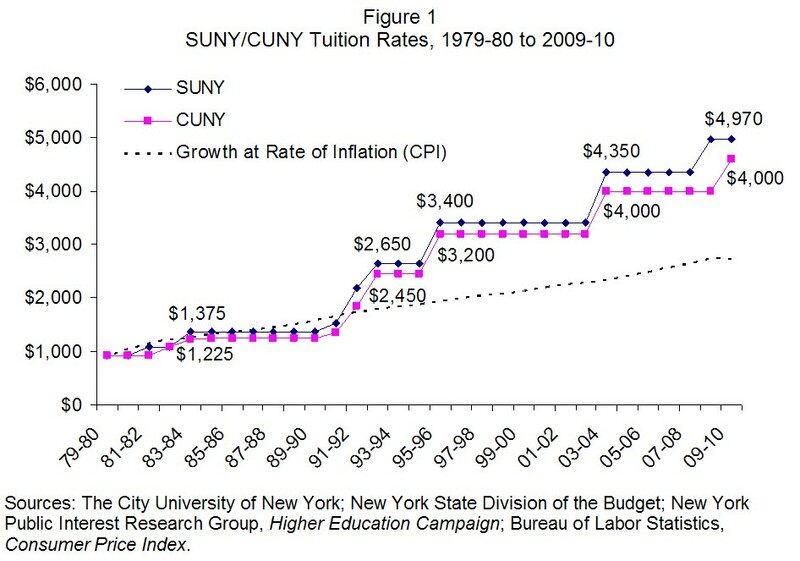 As shown in Figure 1, in 2009, at the height of the current downturn, tuition for full-time undergraduates was increased from $4,350 to $4,970, or 14 percent at SUNY, and from $4,000 to $4,600, or 15 percent at CUNY; in the 13 prior years, it had been increased only twice, in 1995 and 2003, and both times by 28 percent. During periods of economic growth, in the mid 80's, late 90's, and the mid 00's, tuition stayed flat. The pattern of dramatic tuition increases preceded by long periods of flat tuition has been the consequence of linking tuition policy with the State budget process. In times of fiscal stress the State cuts its general fund support for SUNY and CUNY and offsets the cuts by boosting tuition. As a result, some students finish their degrees without experiencing any change in tuition while others face double-digit increases at times when they can least afford them. 1. Remove tuition revenue from the appropriation process. CUNY and SUNY together collect about $2.7 billion annually in tuition. But before they can spend this money, it must be appropriated to them by the Legislature as part of the annual budget process. It is legally possible for the Legislature to appropriate this money for other purposes. The new proposal would allow CUNY and SUNY to control directly their tuition revenue and not require it to be appropriated by the Legislature. 2. Allow SUNY and CUNY to Set Tuition Rates. Technically SUNY and CUNY officials already have the authority to set their tuition rates. However, because, as described above, the Legislature must appropriate the money, the Legislature has had de facto control over tuition. The Legislature could refuse to appropriate tuition revenue raised above the levels they set. The new proposal would therefore effectively give full control over tuition rates to university officials. Permitting the universities to raise tuition without legislative approval would likely lead to tuition hikes. But the increases would be more modest and predictable than those set by the Legislature in the past. Under the proposal future increases would be subject to an annual cap of two-and-one-half times the five-year rolling average of the Higher Education Price Index (HEPI), a nationally recognized inflation index that tracks what drives the cost of higher education. Critics argue that higher tuition would make SUNY and CUNY inaccessible to students from low-income families. While this is a valid concern, compared to the rest of the nation, SUNY and CUNY students currently get a pretty good deal. 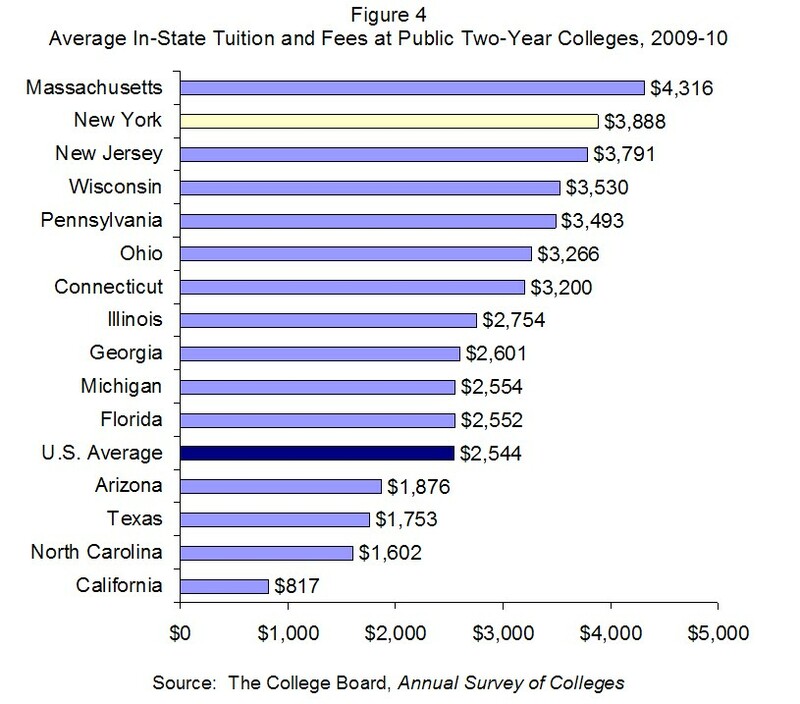 In 2009-10, average tuition and fees for resident undergraduate students charged by New York's four-year public colleges and universities was $5,761, or $1,259 below the national average of $7,020. (See Figure 2.) 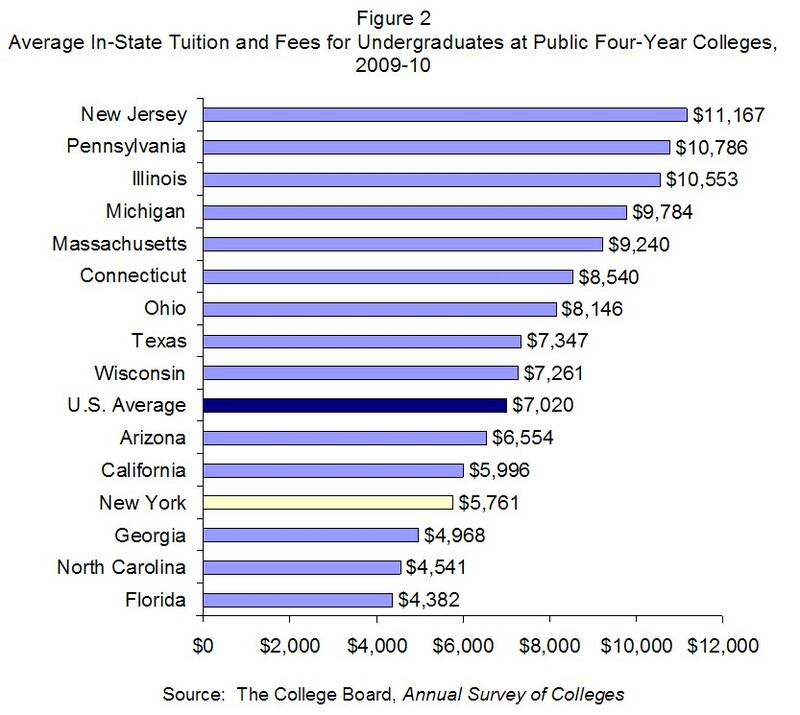 In-state undergraduates in SUNY and CUNY have an even better deal when compared to students in the other 14 states with similarly large public education systems; only three of those states have lower average tuition and fees at their four-year public schools than New York, and the state with the highest tuition and fees among peer states, New Jersey, charges nearly twice as much as New York. If tuition rates in New York were raised immediately to the annual HEPI ceiling included in the reform package, undergraduate students at SUNY's and CUNY's four year colleges would still be getting a relative bargain. The average annual growth in HEPI over the last five years has been 3.5 percent; an increase of two-and-a-half times that in New York would add roughly $500 to the 2009-10 average in Figure 2. At about $6,250, average tuition and fees at New York's four-year colleges would still be below the national average and only the fifth highest among its 14 peer states. A recent study by the Office of the State Comptroller highlighted an even greater discrepancy between New York and other states with respect to tuition for out-of-state students. SUNY's out-of-state undergraduate tuition - $12,870 in 2009-10 - was almost $8,500 less than the average out-of-state tuition at 29 comparable state universities. Among the 14 peer states, CUNY's out-of-state tuition and fees were the lowest for public four-year comprehensive colleges, and SUNY had the lowest out-of-state tuition and fees for research centers. (See Figure 3.) Tuition and fees for out-of-state students enrolled in SUNY's comprehensive colleges were also relatively low, and $1,370 below the national average. In terms of the share of general expenses covered by tuition revenue, SUNY and CUNY also have room to grow. 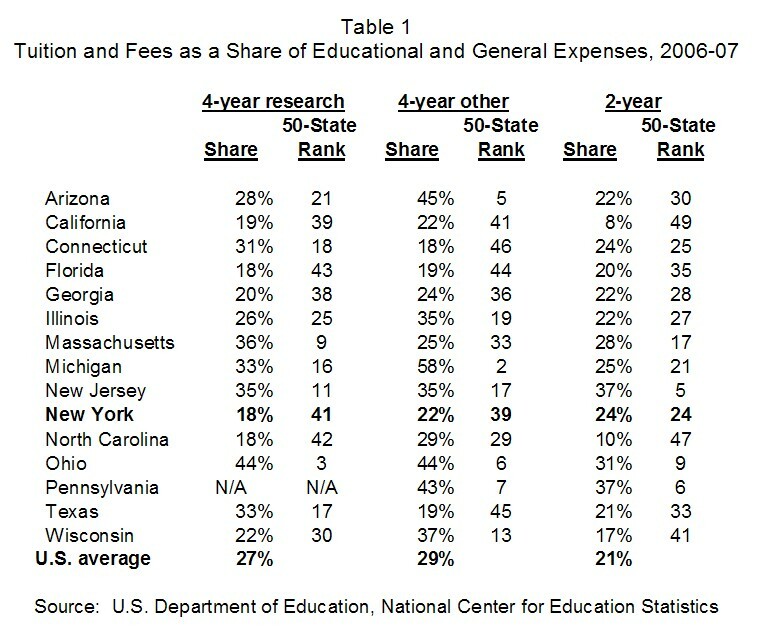 As shown in Table 1, that share in New York was well bellow the national average and lower than in most peer states at both research centers and four-year comprehensive colleges; tuition and fee revenues as a share of expenses at New York's community colleges are slightly higher than the national average, but still considerably lower than in some of the peer states. t should also be noted that low-income SUNY and CUNY students are given considerable aid in paying tuition through New York's Tuition Assistance Program (TAP). It is one of the largest and most generous financial aid programs in the nation. During the 2007-08 academic year, TAP awarded an estimated $827 million in grants to eligible undergraduates. The average state need-based undergraduate aid awarded per full-time equivalent student - $975 - was the highest in the nation and more than twice the national average of $468. Relatively high TAP aid combined with relatively low tuition helps promote access to higher education for lower income New Yorkers. 3. Allow SUNY and CUNY To Set Differential Tuition among campuses and programs. Current policy requires uniform tuition among CUNY schools and among SUNY schools. Variation is permitted only between senior and community colleges within each system, and between graduate and undergraduate programs at each system's senior colleges. In addition some variation is allowed for supplementary fees among campuses. SUNY leaders argue for differential tuition among campuses based on different regional costs and based on different costs for senior colleges that are research centers versus others; these arguments are less relevant to CUNY. However, both CUNY and SUNY leaders argue for differential tuition among different graduate programs at a given institution (for example, medicine versus humanities) based on their differential costs. SUNY leaders seek differential tuition among undergraduate programs based on their cost, but CUNY leaders are less demanding of this change due to the high transfer rate of their students among undergraduate programs. A differential tuition policy makes sense because it allows universities to recognize variation in costs among different programs and/or campuses and to maximize tuition revenue by taking into account market forces such as demand for different programs and regional cost differences. Science and engineering programs, for instance, cost more than humanities due to laboratory needs and more highly paid specialized faculty, just as large research university centers have greater operational costs than small undergraduate colleges. Differential tuition would also bring SUNY and CUNY closer in line with their peers given that, "New York is one of the few major states to shy away from differential tuition pricing." 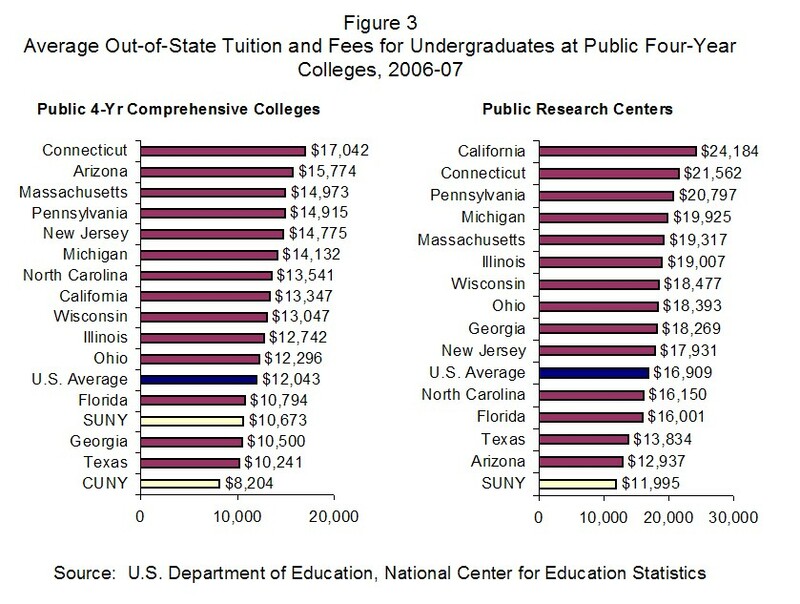 The proposed policies generally make good sense, but they raise two important concerns: (1) Tuition at community colleges might be raised to levels that exceed those in competitor states and limit access; (2) Differential tuition for some programs might reach levels that limit access for lower income students. With respect to differential tuition, the main concern is that it would drive low-income students out of high-cost programs such as pre-med or engineering. One way to address this concern is to use financial aid to mitigate the potential impact of higher and differential tuition on affordability and student choice of academic program. This would likely require expanding the Tuition Assistance Program (TAP), lifting the ceiling on TAP grants (currently set at $5,000), and changing eligibility rules. These changes were not part of the Governor's reform proposal. In fact, the Governor's proposed budget includes cutting TAP grants by $75 and lowering the TAP award ceiling for students enrolled in two-year programs from $5,000 to $4,000 in school year 2010-11. Should the Legislature adopt the higher education reforms, it should also reject the proposed cuts in financial aid. The new tuition policy would not make sense if higher tuition rates were accompanied by reduced financial aid. The act also includes regulatory changes which would give SUNY and CUNY greater independence in spending and contracting, leasing and selling university assets and developing private partnerships for new construction projects. New York State Office of the State Comptroller, SUNY Tuition: Low Out-of-State Tuition Results in Millions of Dollars in Lost Revenue, September 2009, http://www.osc.state.ny.us/reports/economic/outofstatetuition.pdf (March 15, 2010). National Association of State Grant and Aid Programs, 39th Annual Survey Report on State-Sponsored Student Financial Aid, 2007-2008 Academic Year, (March 7, 2010).